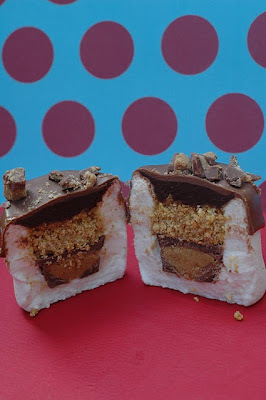 Remember a few days ago when I said "Just when you think there isn't any other possible way to make a s'more, 5 new recipes pop up that you need to try." ? Here is another one of those ideas, this time from Swanky Pear. Another amazing new way to make a yummy s'more. This time it is a stuffed marshmallow, but I like the idea of calling them inside out s'mores more. You can check out how she makes these yummy treats HERE. And you need to know that it uses store bought marshmallows, so you don't even have to wrestle with sticky marshmallow goo.